London: The Parasol Unit Foundation for Contemporary Art is hosting a solo exhibition of Bharti Kher, on view till 11 November, 2012. This is the first time the artist is exhibiting in a public art institution in London. The show comprises selected works from Kher’s recent past, focusing mainly on her three-dimensional creations. Bharti Kher, known best for her ‘bindi’ artworks, like the one featured in our recent Autumn Art Auction, transforms and re-adapts common objects into something surreal yet deeply meaningful in her art. Her works are very personal, reflecting her concerns about society and, on a smaller scale, about herself as well. Through these works, the artist manages to engage a global audience by communicating shared issues and thoughts. Last week, the artist was at the Parasol Unit for a public conversation about her works with Shaheen Merali. The conversation started with a question about the significance of the bindis in her art. The artist explained that bindis for her represented a conceptual underpinning of what they actually were. Bindis are markers of the day and life of people. They are a second skin, they cover and transform the objects and they make the artifacts hers. They also bring a sense of motion, and in some cases, positivity to the entity they are covering. For example, her work, The skin speaks a language not its own,represents an elephant on the floor in the process of dying. However, the elephant seems to be lifted through the bindis. In fact, Kher added that her art is full of contradictions as in this work where death is opposed to lightness and movement. Then the conversation shifted to Kher’s work, The deaf room. 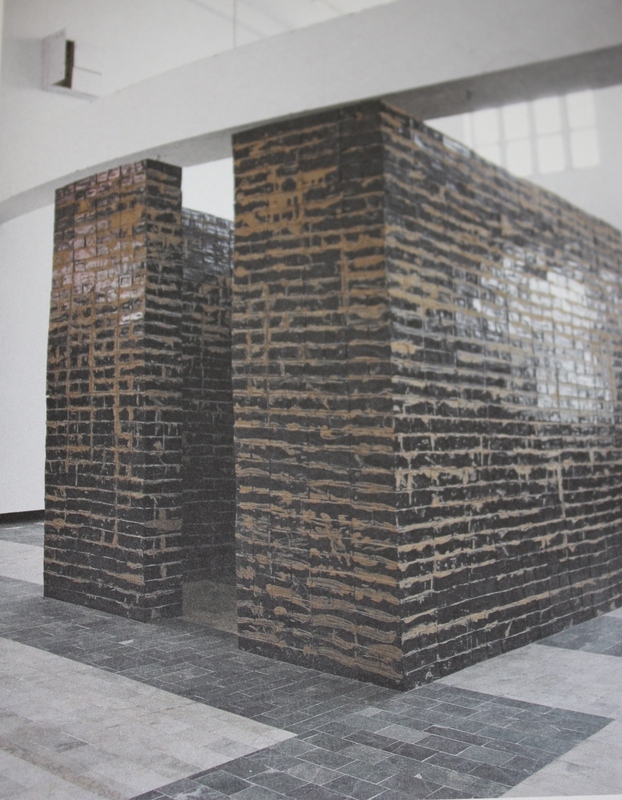 This work represents the wall of a house made of glass bricks which was created to raise the memory and become a witness of the Gujarat riots of 2002. The work was inspired by an iconic image of a burnt house where a pile of bangles was visible too. The idea of the glass bricks made from crushed red glass bangles was developed from this memory of the artist. Talking about The deaf room, Kher explained how important the process of making works was, apart from the final result. In fact, the process of how this specific work was made is what informs us about the tragic events that inspired it. Without knowing these details we would miss a great deal of its meaning. Although the leading idea behind this work is of destruction and loss, the bricks offer a positive reading as well, seeming to hold an almost magic power. The bangles they are made of possess innate positive characteristics because of their joyful sound resembling a dance. Towards the end of the talk, Merali asked the artist what some of the unsolved questions that she wanted to express through her practice were. Avoiding revealing too much, Kher mentioned that the idea of the body and self still prompts her creativity and imagination, but in her next project she wants to bring it to the next level, but it is still a work in progress. Contradiction is definitely a striking element in Kher’s practice, and also the dichotomy between allegory and reality. But no matter how surreal her works are they always manage to transmit Kher’s feelings, especially because she believes her works are reconciliatory. The concept that we worry about so many things in our every-day lives but ultimately we are all just small dots is well expressed in her art. I would really recommend this exhibition, as it is inclusive of a good selection of Kher’s work which describes her practice well. Her strong personality which emerged in the interview and lies in her works too is the result of the thoughts and actions of a contemporary woman brought up in London but who decided to go back to her homeland to find her roots and shape her identity. Her works communicate a sense of multiplicity and underline that nothing is certain and definite and that life is fast moving but important events must be framed in time. On October 9, Kher will be signing her catalogue at the Parasol Unit Foundation in London. More information about the exhibition and this event can be found here. Looks like Indian Artist have mastered to copy Western Artist and make Indian version! such bad works copies of Damian Hirst Dots, Surreal sculpture….tones of them here in UK and europe this artist works are exact copies of Jane Alexander (legend from South Africa) ….bindi used by another artist before this artist in UK relatively unknown some kumari dont remember her name, also the sleeping elephant a copy of Douglas gordon ‘play dead’! each work has some original somewhere! bad show in London at the moment! So called curators promote such silly art to make their living! also to show how little informed they are in world Art! wake up Indian Art world! So true…But Damian too is a copycat..